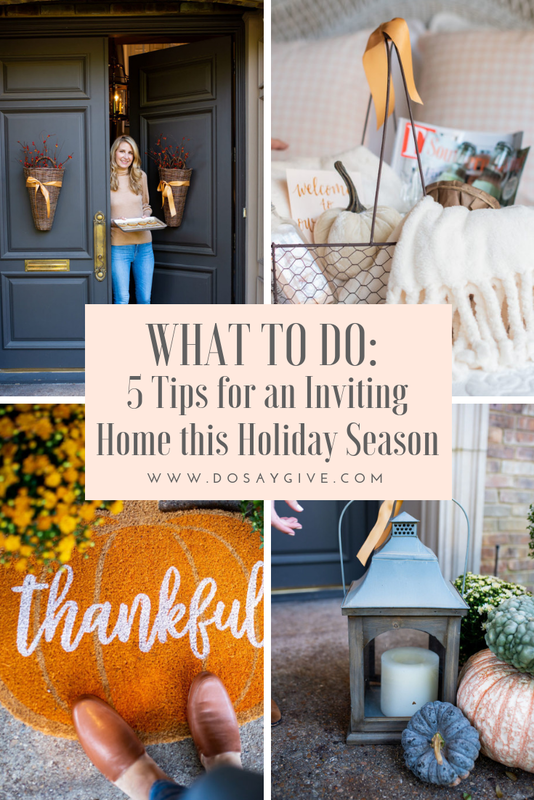 Thanksgiving and Christmas are right around the corner so I partnering with eBay to share some tips to get your home festive and ready to graciously welcome friends and guests. Things you can do now so you aren’t stressed out later! This post is sponsored by eBay. Thank you for supporting the brands I love! 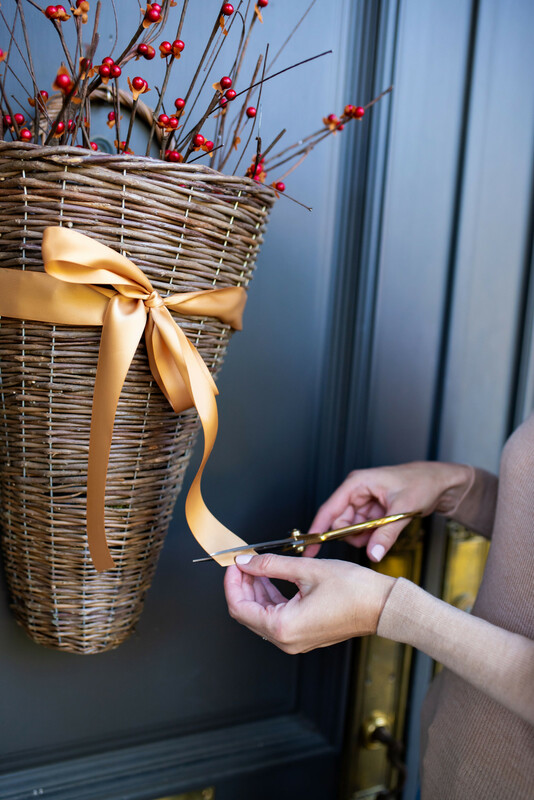 Make guests feel welcome before they even step in your house with a graciously decorated front porch. This year I added little warmth to my normal pumpkin and mums display with a beautiful lantern. 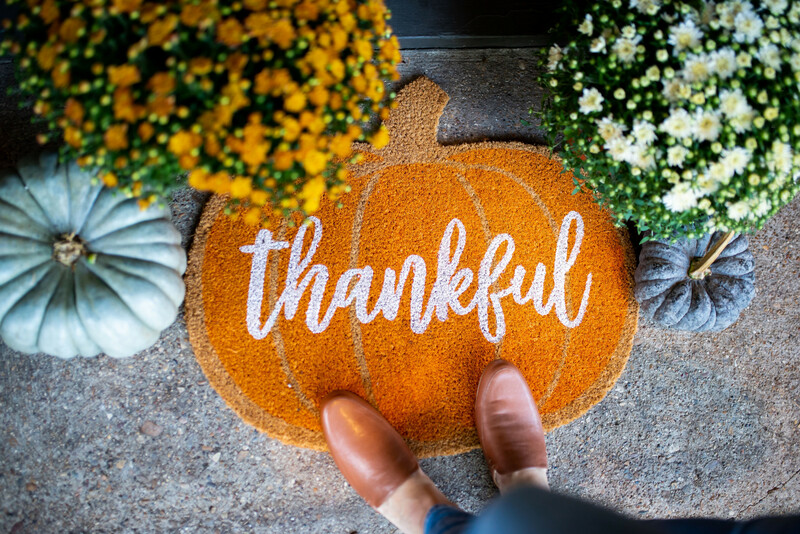 I will keep this look through Halloween and Thanksgiving along with this festive fall doormat on my back porch (don’t forget about your back door if guests come through there more often!). 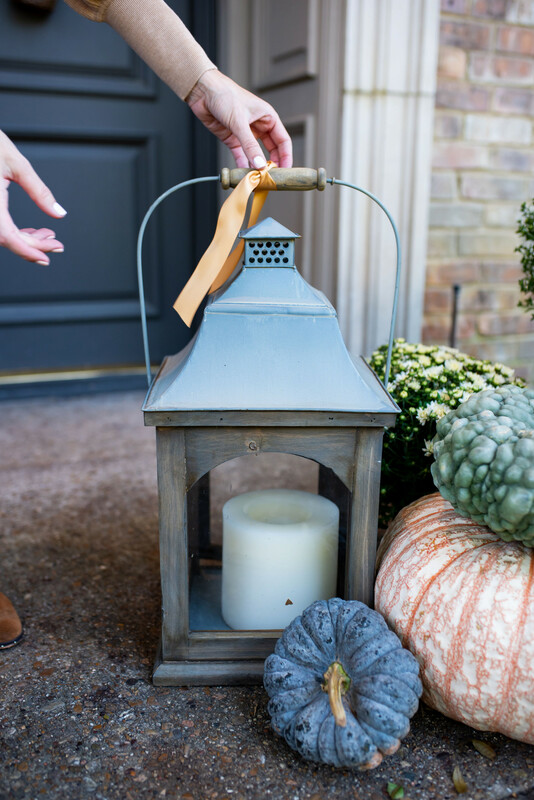 Tip: Outdoor flameless candles with timers in your lanterns – or just on your steps – are nice when you have guests for dinner, especially since it will start getting darker so much sooner with daylight savings time. eBay has so many beautiful holiday decor and accessories like the pretty faux bittersweet branches I found on the hanging door baskets I’ve had for awhile. I plan to use through Christmas – I just may change out the ribbon. 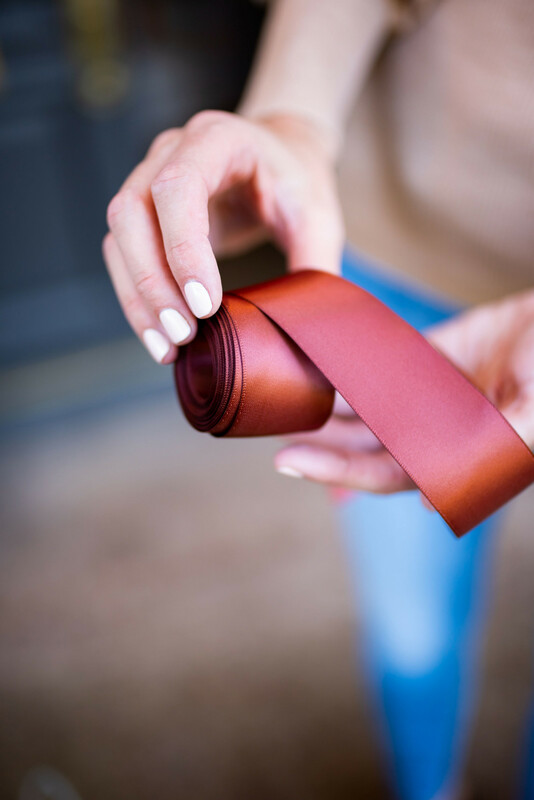 Speaking of ribbon, I like to keep a good supply on hand for all the little gifts I give throughout the season as well as for adding a little elegance to my holiday decor. Perfect to tie up a loaf of pumpkin or gingerbread wrapped in parchment paper. And guess what? I found the BEST source for gorgeous satin ribbon on eBay in just about every color that’s so reasonably priced, too. You can choose the “buy it now” option and it ships free. This shade of gold goes perfectly with my gold mums! 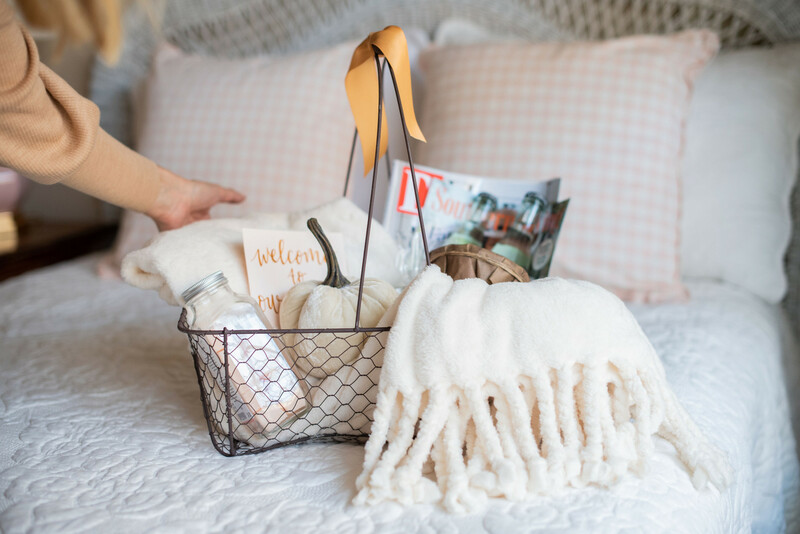 Hospitality means “the friendly and generous welcoming of guests.” And what is more welcoming than a basket full of goodies waiting for them? 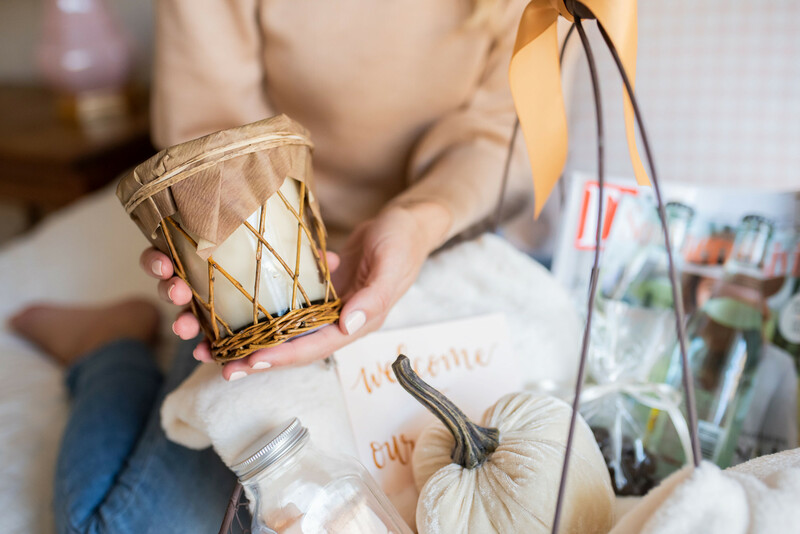 I found the most beautiful items on eBay to create a basket perfect to welcome guests this Thanksgiving, including the coziest throw, bath salts, and those soft velvet pumpkins that are so popular this year! All are NEW on eBay with super fast shipping. Add some bottled water, magazines, extra toiletries you’ve save from hotel stays, and some chocolates for a special touch. Candles (real or flameless) create a warm and cozy environment for guests. I have these lanterns in my den and every evening at 5 pm the flameless candles come on and they just make me so happy. As for real candles, I was so excited to see that my favorite fall scent (that makes a gift!) is on eBay. What I love about this candle is that after it runs out you can use as a pretty vase. Repurpose by filling with flowers and giving to your child’s teacher or a neighbor for a sweet gift. Our children are part of our homes and play a big role in making guests feel welcome this holiday season. And there’s nothing less gracious than a child that won’t look up from his or her iPad when a guest walks into the room. I teach my children to always come downstairs, greet guests and look them in the eye while speaking to show respect. I also give them ideas of questions to ask our guests. The most gracious hosts are the ones who can accept and welcome friends into their home anytime, even last minute. But to be honest, I like accepting people into a tidy home. So I’m always ready to accept holiday guests on the fly with my favorite cordless Dyson vacuum. I can do a quick once over my downstairs in four minutes. Life. Changing. Even better, my children can do this chore while I pop refrigerated cookie dough in the oven to make our house smell even more inviting to our guests. DYSON SALE! Speaking of Dyson I just saw that you can get and extra 25% off Dyson vacums and hair dryers this weekend!I just got a Dyson hair dryer and LOVE it! 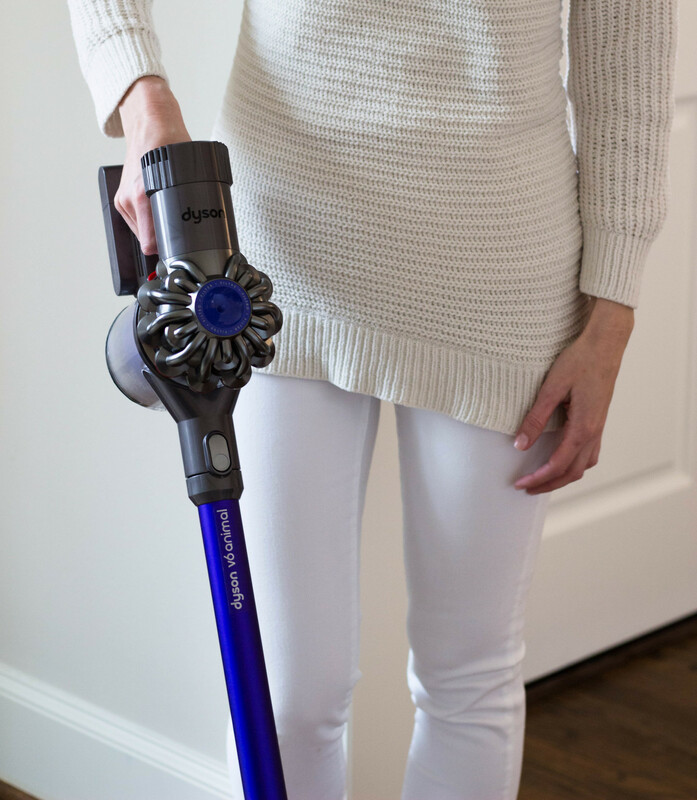 Use code JUSTDYSON. Have any tips for creating an inviting home? Share below! Wow, so nice and unique idea and never heard before. Thanks for sharing!